Test your skills on an obstacle course much like the one seen on the NBC’s hit TV show American Ninja Warrior—and raise money for a great cause! 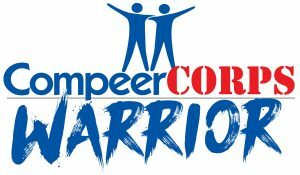 Compeer of Lebanon County presents our second annual CompeerCORPS Warrior fundraising competition Saturday, May 5, 2018 at Paramount Sports Complex. 100% of the proceeds raised from this event will go directly to support local veterans through Compeer of Lebanon County’s CompeerCORPS program. Sponsorship and donation opportunities are all available! Contact Alane at 717-272-8317 for more information. Questions can be directed to Alane Stief, Executive Director, at (717) 272-8317 or director@compeer-lebanon.org. When purchasing your participant ticket, put in the name of your team in the appropriate field. Up to 4 people may be on a team. Can children sign up to compete? Yes! Children 6 and up may compete. They will need a parent/guardian to sign a waiver for their participation. What are the benefits of a business sponsorship? Contact Alane Stief, Executive Director at (717) 272-8317 or director@compeer-lebanon.org to find out how your business can be a sponsor! Please bring your printed ticket or have it readily available on your mobile device. Can I make a donation directly to CompeerCORPS? Donations can be made by check or cash directly to CompeerCORPS up to the day of the event. Please make checks payable to Compeer of Lebanon County.